For today, enjoy this relaxing photo of a Polar Bear lying in the sun. It was submitted by a person whose name I forgot, but still it is a very nice illusion! 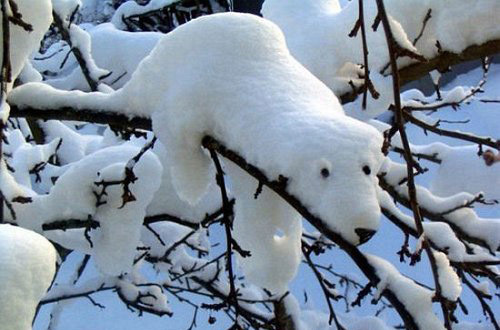 I can’t believe how this snow formation resembles to such a realistic Polar Bear. Have to go now, will keep you informed about the site migration! Not really that big of a illusion, but really great idea! And, it looks really, really cool! wow. that looks really good. are the eyes just the ends of twigs or were they added by photoshop or little stone? Photoshopped but still pretty cool! Imaginative! If it had ears, it would look more like Snoopy. but u kno it looks cool!!! Pretty sure it’s not photoshopped. someone probably just saw it, decided it looked like a polar bear, and stuck some black stuff on. Good job for not n=knocking it, though! I live in a place where you can see all kinds of snow creatures living in trees–but you have to really look for them. probly at least some part photoshopped but is still really cool. Keep the illusions coming, love this site!!! I don’t understand what you’re talking about, but the illusion is very funny! Too bad he had to add on the eyes and nose. It would off been more natural,if not. The new blog is a lot fancier! tell hoo ever made that that they should be famous! Image manipulation is as old as photography itself, contrary to the idea of a photo having inherent verisimilitude. Though not obviously visible to human eyes, image manipulation can be detected by some sophisticated tools, like Photoshopped Image Killer. Which tells you whether your image has been Photoshopped given the image or the image’s URL. I i just want to leave a quick thoughts to state that your blog site was nice. I stumbled upon it on google lookup after going through plenty of other information which was not really related. I thought I would discover this much earlier thinking about how good the info is.